Enjoy free time today before your Andes and Amazon adventure begins. Explore the fascinating Peruvian capital—where high-rise buildings tower above ancient temples and colorful colonial architecture. From its amazing archaeological treasures and gastronomic delights to its scenic beauty and melting pot of cultures, Peru offers visitors a wide array of attractions—and on this tour, you’ll experience its highlights. Begin in the cosmopolitan city of Lima with a guided sightseeing tour, a visit to the Larco Herrera Museum, and a special welcome dinner in an ornate family-owned mansion. Fly to Cusco and descend into the Sacred Valley of the Incas for guided tours of the ceremonial site of Kenko, where ancient rituals were performed, and the Temple of Sacsayhuaman, with its impressive display of stones weighing up to 300 tons. Of course, no vacation to Peru is complete without visiting astonishing Machu Picchu. Built around 1450, at the height of the Inca Empire, it is located in a gorgeous mountain setting above the Sacred Valley. Stand in awe as you witness one of the most majestic images in South America, if not the entire world! Next, fly to Iquitos, where you will embark on a journey to one of the world’s vastly unexplored regions—the mighty Amazon. Experience the Amazon wilderness where it originates in Peru—where biodiversity is at its greatest and the rainforest is untamed. Board one of the world’s most luxurious small ships—the Delfin III—and enjoy fine wine, famous Peruvian cuisine, and all-inclusive comfort while venturing deep into the Amazon jungle in search of elusive wildlife. During your time in the Amazon, take naturalist-guided panga rides through the river tributaries, swim with pink dolphins, and visit native communities—all while returning to your plush five-star yacht. 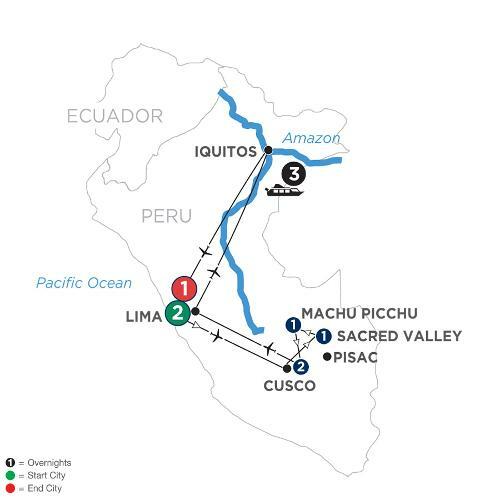 Wonderful scenery, historical treasures, learning opportunities, and so much more—all are yours on this thrilling river cruise adventure to Peru!